…because you are probably feeling a little crazy whether you are hosting or not. I am making a lot of fun things for Thanksgiving and every time I check PW’s cooking feed, I get more ambitious. I had to ask Mike to talk me down from making the pumpkin bread pudding she featured today. Oh man, that sounds good. Pumpkin pie is enough. Pumpkin pie is enough….give me a minute to repeat that to myself a few more times. Okay, back to reality. What was I saying? Easy dinners. Right. May I recommend making some Chili tomorrow. Then you can have Mexican haystacks (further down in the same chili post) on Wednesday–if you can wait. I love those haystacks so much, that is what I am thinking about when I make the chili. On Tuesday, you can make this yummy and easy Greek inspired chicken. 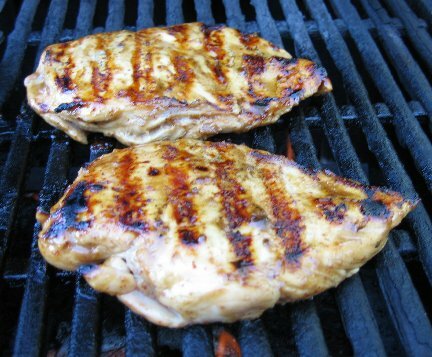 1.Cut a few small slits in each breast to allow marinade to penetrate. Place olive oil, lemon juice, garlic, salt, pepper, and paprika in a gallon bag and shake until emulsified, about 30 seconds. 2. Add chicken and work in, then let marinate overnight. 3.Preheat grill for medium heat and lightly oil grate. Cook about 5 minutes per side or until juices run clear. You may need to watch for flare ups. It is good to have a spray bottle with water to keep the flames down. It’s easy, but this is one of my favorite dinners–and it even works great to serve to friends. It turns out pretty nice. Have fun this week! Adam grills chicken a lot, but just throws on a bunch of BBQ sauce. And I saw the Bobby Flay/PW Throwdown. That bread pudding looked amazing!